Nach Baliye is a dance reality show airing on Star Plus Live which is popular for its celebrity couple who compete against each other. After 7 hit seasons, the show is back with its 8th season and is already popular for its contestants and the judges. The show has celebrities participating in it for the coveted trophy and one couple is eliminated each week based on the score given by the judges and the votes given by the public. The judges of this season are Sonakshi Sinha, Mohit Suri, and Terence Lewis. Sonakshi Sinha has been a complete entertainer on the show but will be replaced by Malaika Arora Khan in the future episodes because of work commitments. The hosts for this season are Karan Tacker and Upasana Singh. The celebrity couples participating in this season include Utkarsha Naik and Manoj Verma, Amanjot Kaur and RJ Pritam Singh, Trupti Akkalwar and Siddhartha Jadhav, Abigail Pande and Sanam Johar, Bharti Singh and Harsh Limbachiyya, Monalisa and Vikrant Singh Rajpoot, Aashka Goradia and Brent Goble, Dipika Kakkar and Shoaib Ibrahim, Divyanka Tripathi and Vivek Dahiya, and Sanaya Irani and Mohit Sehgal. This season has been gaining huge popularity for the amazing dance performances by the couples every week. The judges give a different theme to the participants every week and the dance performances of the couples are based on that theme. Utkarsha Naik and Manoj Verma got eliminated in the first week of the season at the 10th position. The competition has been tough as all the couples are practicing every day for giving their best performance on the stage. In last week's episode, Trupti Akkalwar and Siddhartha Jadav got eliminated as they got low votes from the viewers and the judges. The show is one of the very few reality shows on Hindi TV channels live which have become this popular. 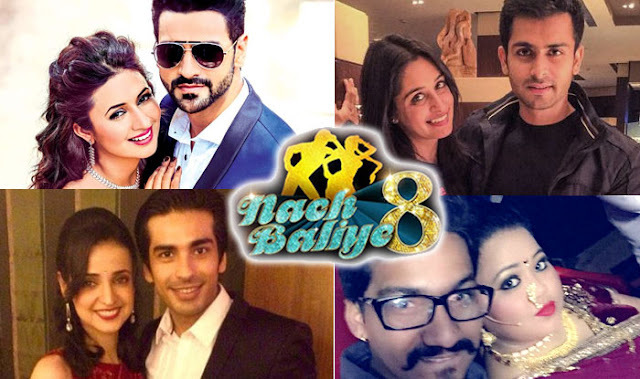 The Nach Baliye 8 has been very successful and is getting a great response from the viewers for its unique format and extraordinary dance performances. The public loves the show as they get to see their favorite television couples get down to the dance floor and show their chemistry. The show has made all the participants and their better halves very famous as the audience loves them for their entertaining personalities. You can watch this show every weekend on Star Plus Live and catch a glimpse of your favorite stars dancing with their loved ones.